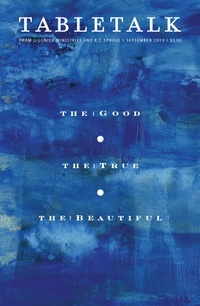 The September 2010 issue of Tabletalk focuses on how the triune God is the foundation for all things good, true, and beautiful. It thoughtfully engages discussions revolving around Christian worship, art, truth, epistemology, Scripture, and the character of God. Contributors include R.C. Sproul along with Frank Cavalli, William Edgar, Makoto Fujimura, Steven J. Lawson, John Lennox, Keith Mathison, Rod Mays, Harry Reeder, and R.C. Sproul Jr. Tabletalk features articles about topics central to the Christian faith and daily, in-depth Bible studies with featured columns. The 2010 Bible studies engage in a thematic and biblical-theological study of the Old Testament, looking at various characters, events, practices, and other elements of old covenant religion that are fulfilled in the new covenant.